Made by the H.P. 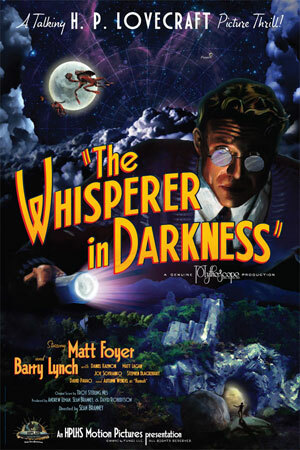 Lovecraft Historical Society like The Whisperer in Darkness. This one is done as a late 1920’s silent movie. Not quite as polished as their other production (this was made first) it’s still a good and interesting adaptation of the work. I have read the original story this was based upon, and it certainly hit all the major notes I remembered. It didn’t draw me in quite as much, I didn’t find this quite as creepy, but that may well be the story itself. Certainly it’s worth a look and is a noble experiment. Again, it uses a mixture of techniques to tell its story, even including a some stop motion animation amongst the computer graphics. Both films are well worth tracking down from the store and checking out. They don’t cost much, and they are interesting, especially because they show a certain level of craft and originality of approach. One of two films made by the H.P. Lovecraft Historical Society. I like the approach of both, in that they looked to when the original short stories were written, then tried to film them in a way that echoed film-making from that time. So this one is an early 1930’s film noir piece. My only complaint about the filming technique is that they don’t know quite how to work with black and white. There’s too many muted tones that show a lack of knowledge about what colours work with a black and white process, and there are small issues of contrast as well. But hell, major Hollywood film The Artist got the same stuff wrong. I wanted to get my main complaint out of the way first, because I really liked this. I genuinely felt creeped out at times, and there was a growing sense of dread as the story progressed. It really is a very well done piece of film-making. It shows great restraint at times, and has a good feel for when to hint at things and when to finally show them. Having not read the original story, I can’t say how faithful the adaptation is, but I suspect they’ve done a reasonable job. The effects work is well done too, using a wide range of techniques including computer graphics to mostly solid effect. Overall, while not a perfect production, it is very, very good.